Best golf club in Thailand? It is one of the oldest and best golf clubs in all of Thailand? Its facilities are definitely not five stars however it was designed before there were golf course designers and not constructed but planned around the natural surroundings. 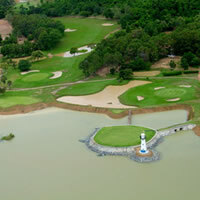 These 36 holes were built by the Thai Navy and opened for business in 1969. They are called the four points of the compass, North, South, East and West. North and South are the original course and East and West were finished in the 1990’s. If you are a nature lover you will adore this course. This fantastic course includes loads of natural wildlife including troops of monkeys playing around and being cheeky. The most notable hole is the 9th hole on the South Course a par-3 with its own lighthouse island green. Also there is a rope lift too help you up to the club house to quench your thirst at the end of the game. The course however is quiet challenging mentally and physically so bring your A-Game. This is a fun challenging course with friendly staff, natural layout, great clubhouse and is very well maintained. The golf, Thai food and drink are all reasonable priced.